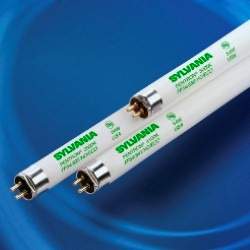 Sylvania T5 Pentron 800 Long Life Fluorescent Bulbs - Description; A fluorescent light bulb produces less heat, so it is much more efficient. A fluorescent bulb can produce between 50 and 100 lumens per watt. This makes fluorescent bulbs four to six times more efficient than incandescent bulbs. That's why you can buy a 15-watt fluorescent bulb that produces the same amount of light as a 60-watt incandescent bulb. There is a stream of electrons flowing between the electrodes at both ends of the fluorescent bulb. The electrons interact with mercury vapor atoms floating inside the bulb. The mercury atoms become excited, and when they return to an unexcited state they release photons of light in the ultraviolet region of the spectrum. These ultraviolet photons collide with the phosphor coating the inside of the bulb, and the phosphor creates visible light.